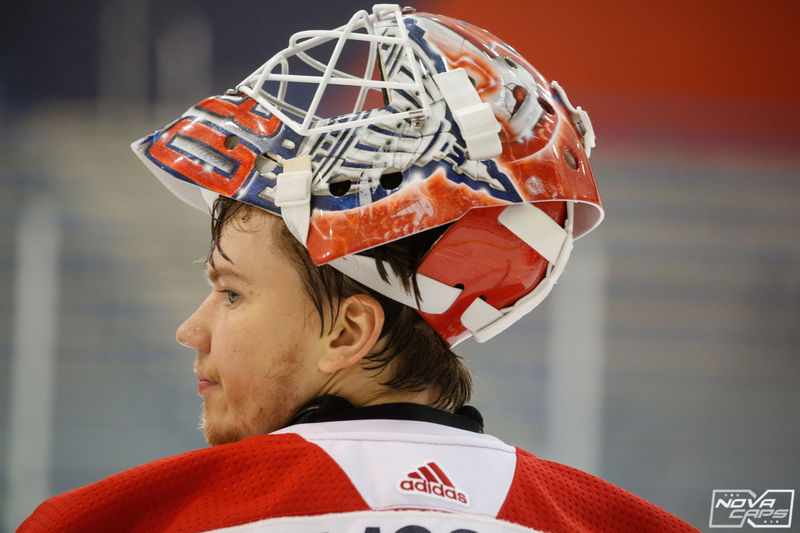 Ilya Samsonov is finding his way in this brave, new world. The Capitals number one draft pick in 2015 (#22 overall) is beginning to adapt to life in the states and the North American “style” of hockey. This post focuses on a review of his first 24 games in North America. The heir apparent to the Holtby throne spent a good portion of last summer in the United States, traveling the country, working on his game, learning English and contending with other general challenges related to a migration from Magnitogorsk. Many players have not made a similar leap a successful one (See Sergei Shumakov and Axel Jonsson-Fjallby), but Ilya appears to be adapting quite nicely. He reported to Capitals camp early, participated in informal skates at MedStar, turned in an excellent prospect tournament showing, worked hard in Capitals training camp, and is now continuing his progression Hershey. With Holtby’s contract set to expire at the end of next season, and pending heavy-weight contracts required for Alex Ovechkin and Nicklas Backstrom on the near horizon, the Capitals ideal plan is to have Samsonov move his game to the Nations Capital at the end of next season, but don’t be surprised if things move a bit quicker. Samsonov could begin seeing extended time in Washington as early as this fall, or sooner (trade or injury). Samsonov, who turns 22 later this month, is “sticking to the script”. So, let’s take a look at how Samsonov’s first 24 games in north america has gone. Samsonov’s trajectory could have been probably forecasted last July. A very slow start, which included a GAA of just above 4.00 at one point, was followed by gradual improvements, both statistically and personally, followed by brief glimpses of his stellar capabilities in goal. If you’ve closely followed his play since his KHL days, you are not surprised by any of this. It should be noted that the Bears were also dealing with a number of issues on the blueline in the first three months of the season. Injuries, call-ups, inexperience are all part of the AHL game, but the Bears dealt with a little more than their fair share from October to December. It should also be noted that Vitek Vanecek has had a very strong year in goal so far, and at times, particularly earlier in the season, was the clear number one netminder in Chocolate town. More on him in the coming days. For the year, Samsonov is 11-11-1-2 with a 3.00 goals against average (GAA) and a .885 save percentage. We purposely set a bookmark for 24 games, knowing there would be ramp-up time for Ilya. In a nutshell, it’s been a tale of two seasons, so far for the netminder. As many of you know by now, Samsonov changed his uniform number from #1 to #35 at the beginning of the year, and since that change, has gone on a tear. Coincidence? Likely. His numbers improved in January, about the same time the Bears blueline began to gel and Connor Hobbs returned to the lineup. A factor? most likely. An indication of this can be seen in the number of shots he faced in each game. Samsonov faced an average of 19 shots per game in the month of January. Conversely, Samsonov was inundated with shots in November, averaging 32 shots faced for the month. Samsonov’s first 15 games (October through December) went as to be expected. As previously noted, there were definitely more than a few tough nights in goal for Ilya in 2018. The last 10 starts is another story. 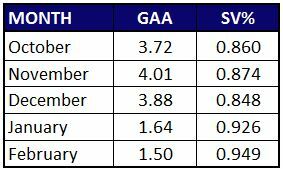 Samsonov pitched consecutive shutouts in January, the first of his AHL career, and had a GAA hovering around a goal and a half. 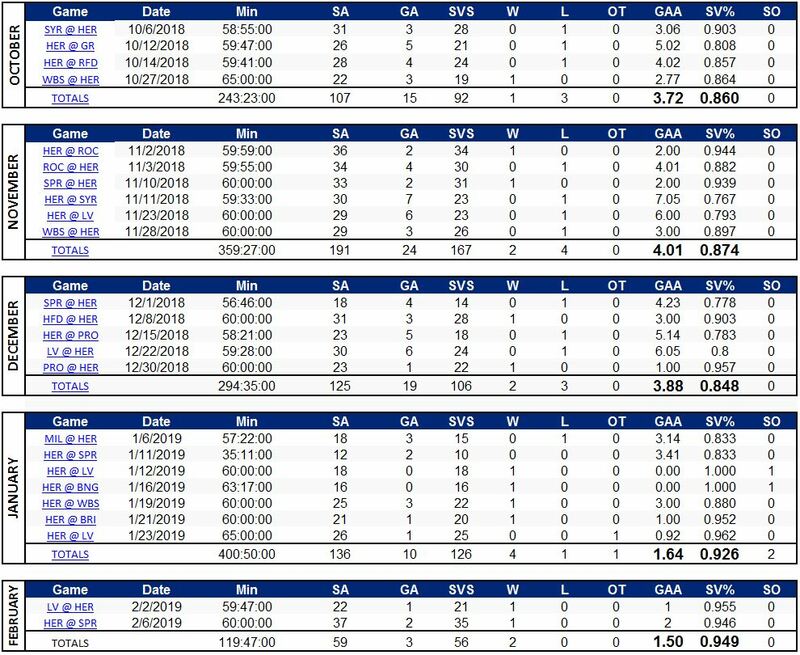 While Samsonov has a much better save percentage on the road, it should be noted that a large number of Samsonov’s road games came in January, as his season was turning around, Connor Hobbs returned to the lineup, and the blueline began to gel. Ilya has elite-level reflexes, particularly rare for a 6′-2″, 205 pound netminder. His quickness enables him rapid lateral, post-to-post movement. However, this agility also has him over-reacting at times, and thus, finds him out of position for follow-up shots. This is still occurring at times in Hershey. In one recent game, after a flurry in front of the crease, Ilya ended up facing the goal with his back facing the follow-up shot. Not ideal. Samsonov continues with what will likely be a career-long focus for him. Remaining correct, calm and “quiet” in the crease. It appeared that teams were beginning to focus shots on Samsonov’s glove-side, particularly earlier in the season, by teams Hershey faced on a regular basis and likely had a pretty good book on him (Lehigh Valley and Wilkes-Barre/Scranton). However, the glove side focus seams to have subsided in recent games against those same teams. Samsonov, for the most part, is strong with both glove and blocker sides. The Capitals organization is fairly deep at the goaltending position. 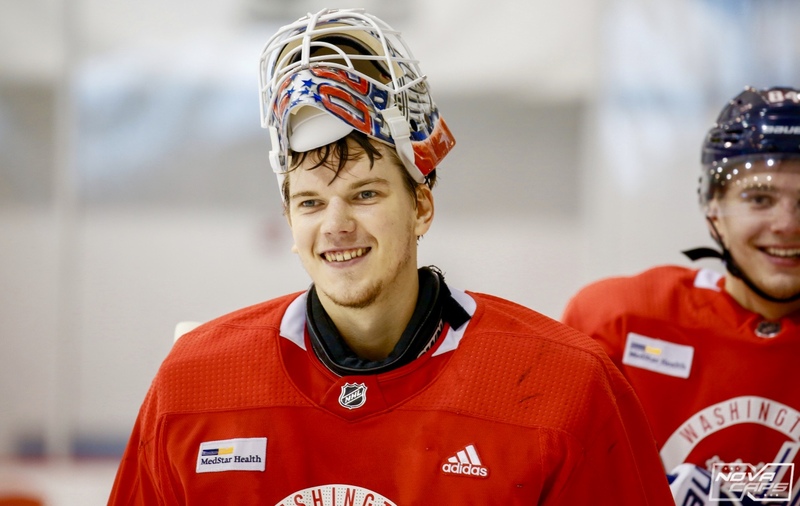 The next generation in Washington (Ilya Samsonov, Vitek Vanecek) appear to be in synch with their ideal professional career trajectories. On the near horizon, look for an extremely competitive battle for the organizations starting and backup positions this summer and fall, as (barring trade) Holtby, Copley, Samsonov and Vanecek will all be looking to stake a claim in the District. They might want to sell tickets to that one. This entry was posted in News and tagged Capitals Prospects, Hershey Bears, Ilya Samsonov, Jon Sorensen, KHL, Metallurg Magnitogorsk, Washignton Capitals Prospects, Washington Capitals. Bookmark the permalink. Sammy does it again tonight. Stops 29 of 30 shots.